Chamberlain Hrdlicka has extended its lease at Two Allen Center in downtown Houston. HOUSTON – (Realty News Report) -National law firm Chamberlain, Hrdlicka, White, Williams & Aughtry has announced the long-term extension of its lease in Two Allen Center, a Brookfield Property Partners building in downtown Houston. Under the terms of the new agreement, Chamberlain Hrdlicka will continue leasing its 55,178 square feet of office space on the 13th and 14th floors of Two Allen Center until 2028. Known as “Chamberlain Hrdlicka,” the firm was founded in Houston more than 50 years ago and also has offices in Atlanta, Philadelphia and San Antonio. .David Guion and Tim Relyea with Cushman & Wakefield represented Chamberlain Hrdlicka in the transaction and JLL’s John Pruitt, Bubba Harkins and Jessica Ochoa represented the landlord, Brookfield Property Partners. 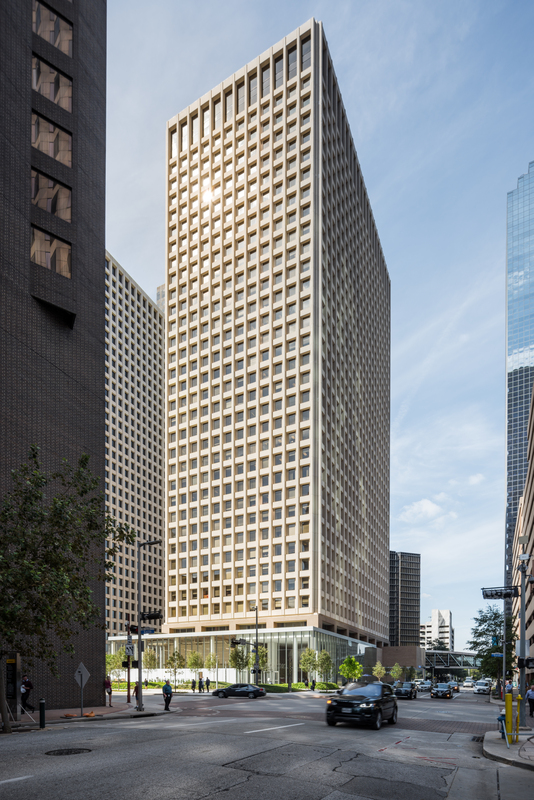 Brookfield recently completed Phase One of a $48.5 million redevelopment of Allen Center, a seven-acre office complex with 3.2 million SF near the corner of Smith and Dallas streets. Brookfield demolished a skybridge and a berm that had blockaded the office workers from Smith Street. 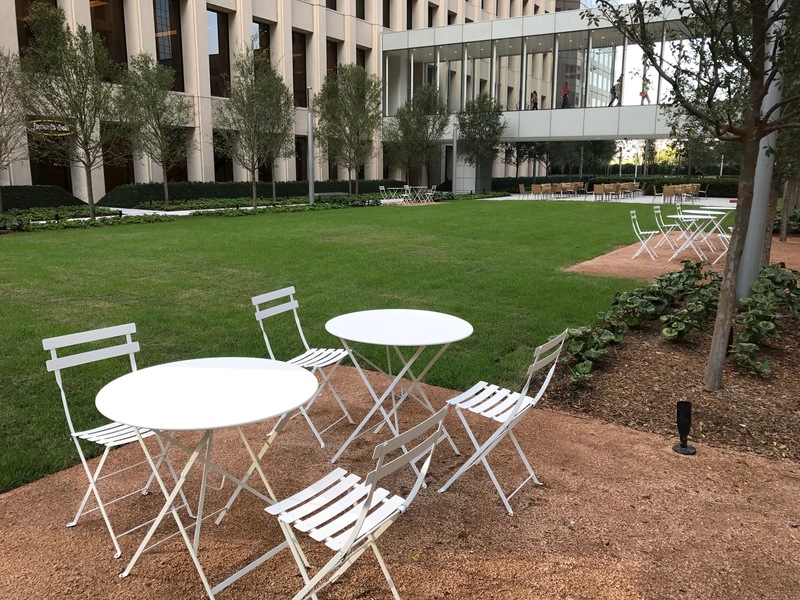 Brookfield Property Partners has created a park at its Allen Center complex in downtown Houston. Photo credit: Ralph Bivins, Realty News Report. Under a design conceived by the Office of James Burnett, Brookfield created a green park space called The Acre between the One Allen and Two Allen buildings. Artist Tokujin Yoshioka installed a major work of art in the lobby of the One Allen building. Two Allen Center, 1200 Smith St., is a 36-story tower. The 996,000-SF building, designed by Lloyd Jones Brewer & Associates, was completed in 1978. Chamberlain Hrdlicka is completing its own renovation of its own space, a $2 million upgrade of the lobbies on both of its floors and other improvements. Ken Harry of Abel Design Group Ltd. led the design team. “Chamberlain Hrdlicka’s re-commitment to Two Allen Center is an affirmation both of the strength of Downtown Houston and Brookfield’s aim to create a uniquely vibrant and sought-after destination,” said Travis Overall, Executive Vice President and Head of the Texas Region for Brookfield.